ChoirChimes is offered to older children grades 3-5. Some music background such as piano is helpful but not necessary. Some limited music theory is included in the class as children are introduced to their first ringing experience. The group rings three-four times during the course of the year. Young Musicians Choir is offered for children through grade 5. They meet September –May and sing throughout the year. They also participate in a one day children’s choir festival held in February and have the opportunity each year of participating in CANTUS: a summer music camp held on the campus of Lenoir Rhyne University, Hickory, North Carolina. The camp is led by Ministers of Music in the surrounding area who value a quality children’s choir camp. Musical Opportunities are offered for youth of First Baptist Church in grades 6-12 September through May. Youth Handbells meet each Sunday 3:45-4:30. They play for worship approximately six times a year and participate in the Youth Handbell Festival offered in early Spring. The youth choir, named Alpha and Omega Choir is for youth in grades 6-12 and meets each Sunday in the Music Suite from 4:30-5:30 p.m. They provide music for worship throughout the year. They prepare and participate in the Youth Choir Festival held at First Baptist Church, Greensboro and offered by the North Carolina CBF. Every other year our youth join forces with the youth of FBC, Mt. Holly to do a Summer Youth Choir Mission Tour. Alpha and Omega Choir has performed mission tours across the United States most recently to Cleveland, San Antonio, Florida, Pennsylvania, New York City, and Chicago. Each choir mission tour that Alpha and Omega Choir participates in is steeped in Ministry and Spiritual Growth. Youth are challenged to grow in love for Christ and for others. These include worship through music, service to others, hands-on mission opportunities to share the love of Christ, daily quiet times with God where individual may read their Bibles, individual devotions, prayer and listening for God’s still small voice and Group Devotions where Adults leaders guide the youth in group discussions, prayer and sharing times of how they have seen God at work that day. Our Adult Handbells is open to adults eighteen years and older. This group rings five octave music. Some musical knowledge is helpful in ringing advanced music. This group meets September-May. The group has participated in many festivals offered on the North Carolina State level and played three full length Christmas Concerts in downtown Marion and now offers a Mini-Concert before worship during December and April and plays periodically in worship. 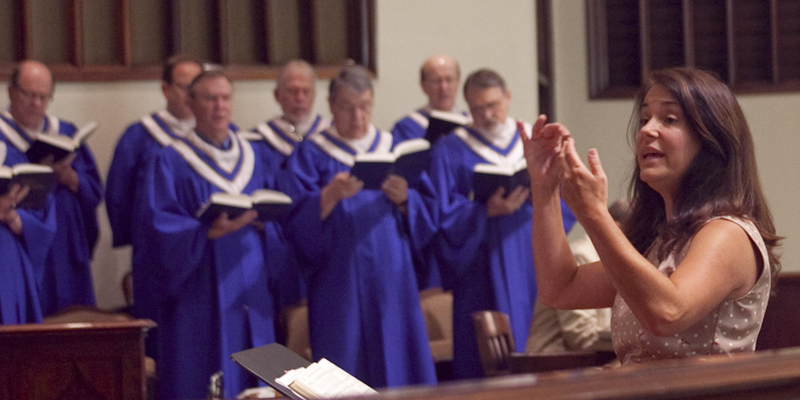 The Sanctuary Choir is open to all members at First Baptist Church who enjoy singing. The choir meets each week in the Music Suite September through May and in the Summer the choir meets in a more relaxed setting once in June, July and August. The music utilized in worship covers a wide gamut of musical tastes but is always Christ centered. The Sanctuary Choir during the course of the year sings each week for worship and presents at least two major presentations during the year. The Senior Adult Choir affectionately named the Saints Alive Choir is open to adults 50 and older, and meets on Wednesday mornings in the Chapel from September through May. They sing occasionally for worship, for the Hanging of the Green Service and tour the area nursing centers each fall and spring with a musical program.